For those of you who’ve been asking1 here’s more photos of the garden. Did you notice the native violets (Viola hederacaea) underneath? Eventually those lovely violets will go cascading over the sides of the pots. It will be so gorgeous! Though I also tend to find that some evil beastie has been doing some munching! Grrr. If I find the culprit I destroys it. How dare it eat our garden?! The outrage! Okay, yes, I know that it’s all part of the beautiful cycle of life and blah blah blah but they can go eat someone else’s baby ficifolia. I wasn’t sure about having grass trees. They’re so amazing in the wild that I wasn’t convinced they’d look okay confined to a wee pot. But they look incredible. I spend hours on the deck just watching the wind move through their fronds. I think I am in love with our grass trees. 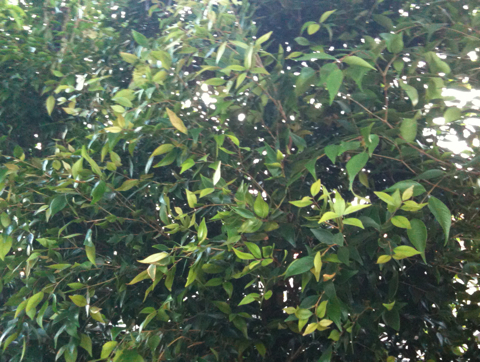 That’s Syzygium luehmannii or as it’s more commonly known lilli pilli. There’s now a wall of it guarding our bedroom and giving us good dreams. Bless you, lilli pilli. Posted in Garden, Praising, Sydney/Australia, Viewing. You do know, Joe, that I can reach out through the intramanets and strangle you with my bare hands? What the . . . you have images blocked! It’s beautiful. I am jealous. We’re going to miss you commenting around here, Joe. Oooh, pretty. I love Australian natives. Our whole garden (west of Sydney) is done up with native plants, so I totally get your garden-love. Dave S. & Sass: Thank you! I think I’ll go out there now. 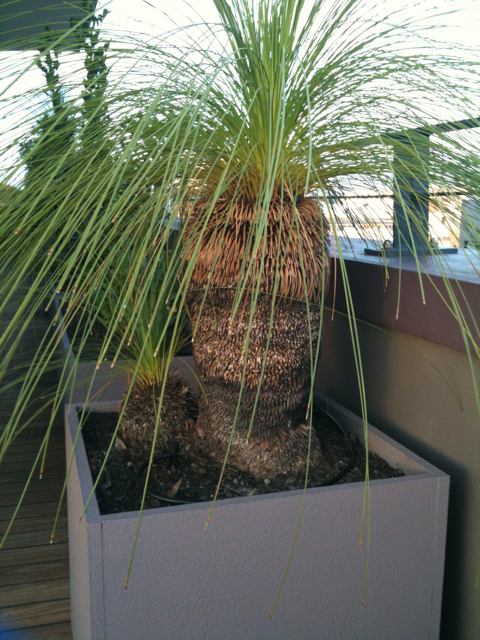 We have a grass tree growing just outside our kitchen-sink window. Especially when it’s raining and the fronds bounce as the drops fall from them I can stand there lost in contemplation with my hands in the suds for a very long time. 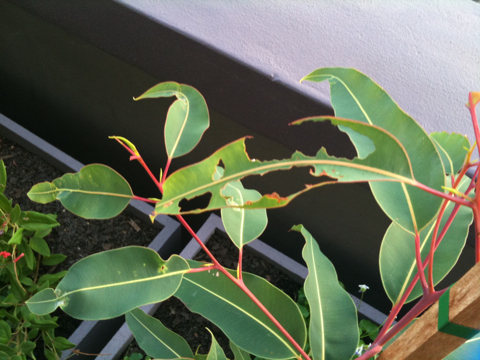 A flowering gum on your balcony? Unless you’re planning to create an elven tree ladder for the 6 floors above you, I’d start practicing your bonsai skills. 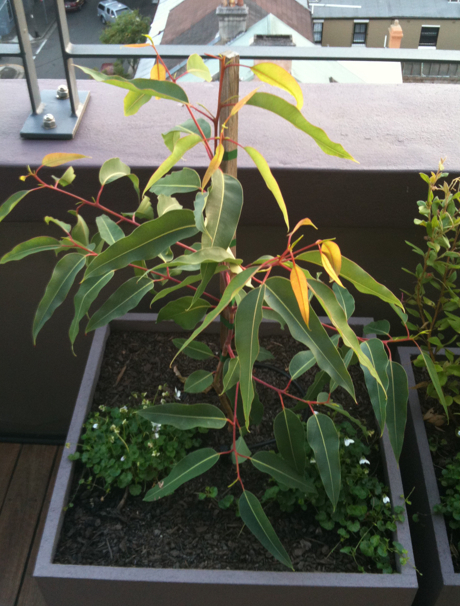 cameron: Growing in a pot we’ll be very lucky if it gets to two metres tall. A metre and a half is more like it. Thank you for more pics of your garden. When you listed the plants before you didn’t mention the gum. I love ficifolia’s beautiful red flowers. There are so many of these trees in ppl’s gardens where I live. 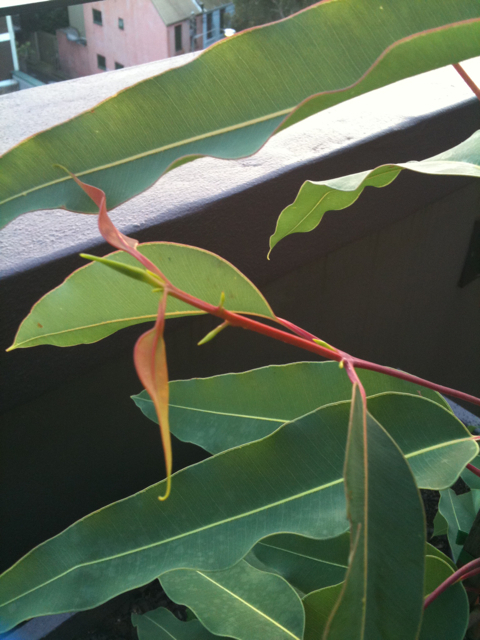 Btw a young gum has bigger leaves than an “adult” one, like a puppy it grows into them. I am worried about your ficifolia’s continued health in a pot (because it wants to grow big, big, big) but I’m sure your love will do the trick (and a bit of root pruning). And you have two different insect attackers – the one eating the leaf out (a caterpillar) and one that’s making the end of the leaves squish up. My friend Jill Midolo, who did a lot of stuff for the CBCA (and i’m following in her footsteps) loved Liar as much as I did and we both hoped, hoped, hoped it would make the shortlist. Jill also loved native plants as much as me. I wish I could have shown her the photos from your garden, but she’s been in hospital for seven weeks and died at Easter. In between my tears, your beautiful plants made me smile. ClareSnow: I don’t know what to say. I’m so sorry about your friend. Glad my attempts at gardening made you smile.